Actually, most people don't know that. 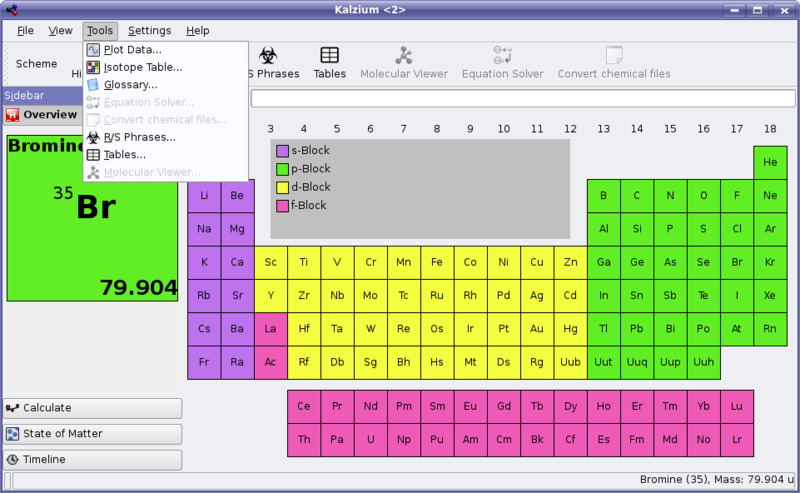 Also, Kalzium is not X-specific but also works on Mac and Windows where you usually don't have a X-Server. AltGr + i --- cool! I didn't know that. The things one can learn from reading the .news! what is the "gr" in alt-gr? I don't think I've ever seen anything labelled gr on a standard keyboard. In the first version we used the Unicode-version. But on many systems there are fonts installed which do NOT ship that symbol. Instead of a nice symbol they got a square. That is now one year ago and the situation still didn't change. We could force certain fonts or test if the symbol is included in the font (and if not use '->' as a fallback). Are you willing to send me a patch or are you just trolling? If you want to look for code that tests if a glyph is in the font, take a look at the password box that now tests if a certain black circle is in the font and otherwise display a * IIRC. But please do something like this, the "->" just looks clumsy, especially because the "-" and ">" don't vertically align properly. You should allow that users enter "->" of course. And btw, situation has changed a bit since last year, since many distros have switched from bitstream vera to dejavu as their default font, and the latter has the arrow symbol. Also, testing a bit with Qt4 shows that the font substitution algorithms have improved since Qt3. So if one font has the arrows, it should be able to display them. If you don't have DejaVu, it should be able to pick it up from Arial from MS corefonts for example (that's at least how Qt4 does it here when I uninstall DejaVu). I would safely say that most users have at least one font with the arrows installed these days, and in that case Qt4 will show one for whatever font you have picked. Doesnt the solver itself matter a bit more than a unicode detail ? Now for the unicode, many linux distributions provide a default font where the arrow does not exist. 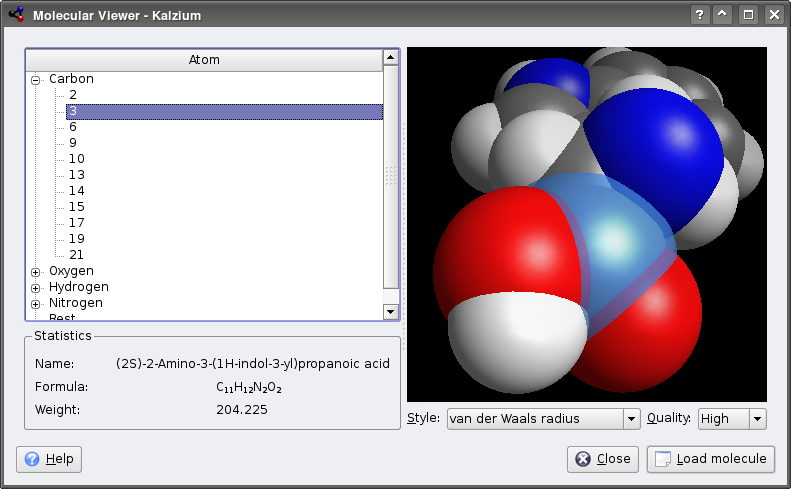 Will KmPlot formulas and images can be integrated in Kword? Why must all geeky apps consist of nothing but fluorescent colors? We left the EGA color palette ages ago, so please make an effort not to burn out eyes. Simply turning down the saturation slides might help.? And no, I'm not some artistic type: I'm a programmer and I have a sense of color, simply because I paid attention to it. Do the same, and you'll find people will suddenly not cringe when they see your presentation slides, graphs or flowcharts. As for kmplot: I have to wonder why almost 2/3rds of the toolbar is dedicated to 3 buttons labeled "coordinate system I/II/III" when literally the only useful element is their icons. The huge buttons would just be as informative without a label (or if you have to add one, how about "Axes" ? ), and would be best merged together in a single drop-down or horizontal button group. Or best: provide a simple "+" shaped diagram and let the user toggle each of the axes on or off by clicking them. Seriously, take some cues from OS X's built-in Grapher application. 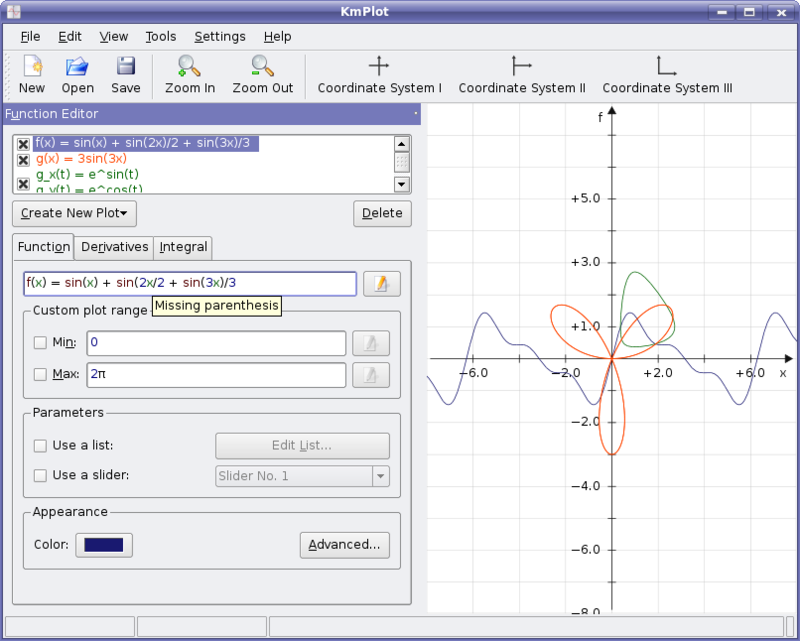 It's tons easier to use, because it doesn't shove advanced features in your face if all you want to do is plot a graph. It has a much simpler layout, and keeps complicated options (such as exact coordinate ranges) away from the main screen using inspectors (aka floating palettes). Graphing applications should make it trivial to make simple doodle graphs and not be too obsessed with exact measurements until you need them. The math entry is transparent... you type things like "e^x" "sin x" "1/x-1" but they get formatted and edited appropriately. Generally speaking, I think you have a problem if you design a graphing application where only a small part of the window is actually *covered by the graph*. Wasn't KDE4 supposed to be much more usable? The toolbar icons can/will change, nevermind the fact that you can disable text in the toolbars anyway. The function of those buttons just adjusts the viewport anyway, not really changing coordinate systems. The actual adjustment when you click the button is pretty slicks - the graph smoothly slides around in the viewport. Regarding the last line, I resized the window to that point - which is much smaller than my screen. If I had maximized the program, the graph would occupy nearly 80% of the screen space. Just a function of reducing screenshot size for publishing. Please keep in mind that this is a development version of the program, and that the features going in are still a work in progress. However, if you've ever used KmPlot from KDE 3.x, you'd already understand how much of a huge improvement this is. And that's really the point of these articles, to show that there is progress happening for KDE 4. Release is still many months away - we probably won't even see a beta until summer, so things can still change greatly. Someone teach this "programmer" what open software development is. I'm just fed up with all this people whining and shooting at the developers everytime they show something new. Do you know what open development is? Do you think OSX's Grapher looked like that final version all the while they were developing it?. The toolbar label issue is something talked about a thousand times already. IT IS NOT FINAL. KDE4 will have HCI guidelines (which are on the works) and we'll see how the usability theme pans out. Why do this people come here whining all the time?. Or look at Zack's last couple of blog entries. Even when warns he was "just trying to do something visually funky" someone has to complain "and what is the usability case, exactly". Go get a life and stop whining. Ever heard what creativity is? KDE4 UI has looked much like KDE3 all this time, it is still more than half a year away and developers are still getting the core libraries right. They haven't focused on looks at all yet. I agree with many of you points. However, as other persons already mentioned, you could have expressed yourself better. The last comment is stupid. If I were you I would talk to the developers and give suggestions. And not compliance. first of all, i'd like to say thanks for the great work on KDE-Edu. I'm a bioinformatics student at the University of Tuebingen and one of our professors is developing this program (library respectively) to view biological molecules (BALL-View) and to perform biochemical computations (BALL lib). thanks for drawing our attention to this app, it looks impressive. The old main window was probably a bit crowded, but the pendulum seems to have swung quite far the other way. If the font size of the symbols can't be set by the user I suggest increasing it to the size from the 3.5 version. Some people (teachers?) 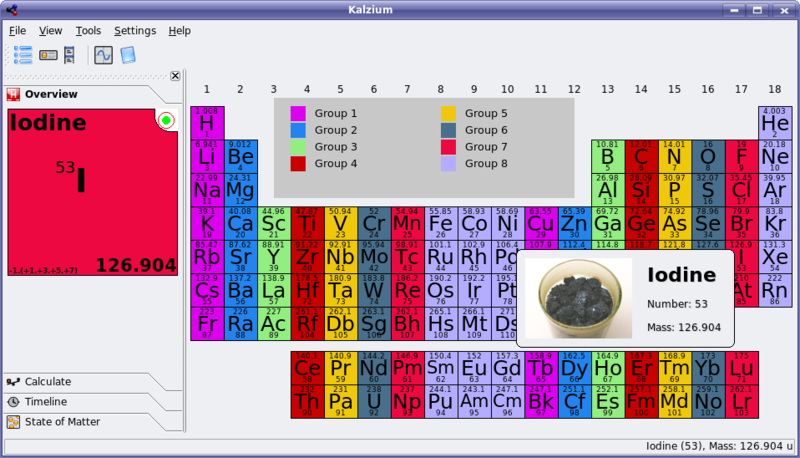 may also find it useful to have the mass available in the main window for all elements. Will the information that is displayed be configurable (hooray), or did you just decide it was too crowded (hoo)?